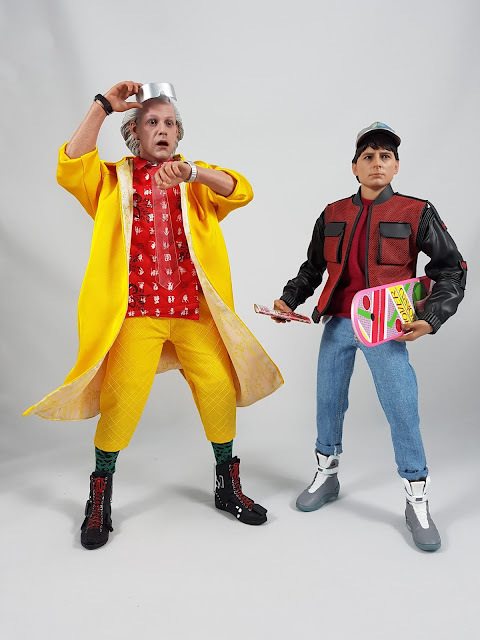 I got the new Hot Toys Marty McFly recently from Back to the Future Part 2, so it's good that they released the Doc Brown to complement Marty pretty soon after. 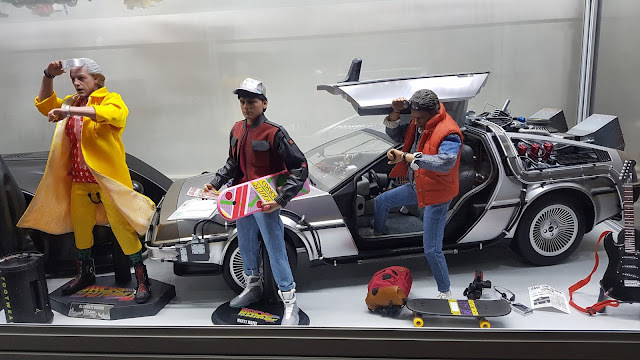 This is unlike the original Marty release that still does not have a radiation suit Doc to display with him. 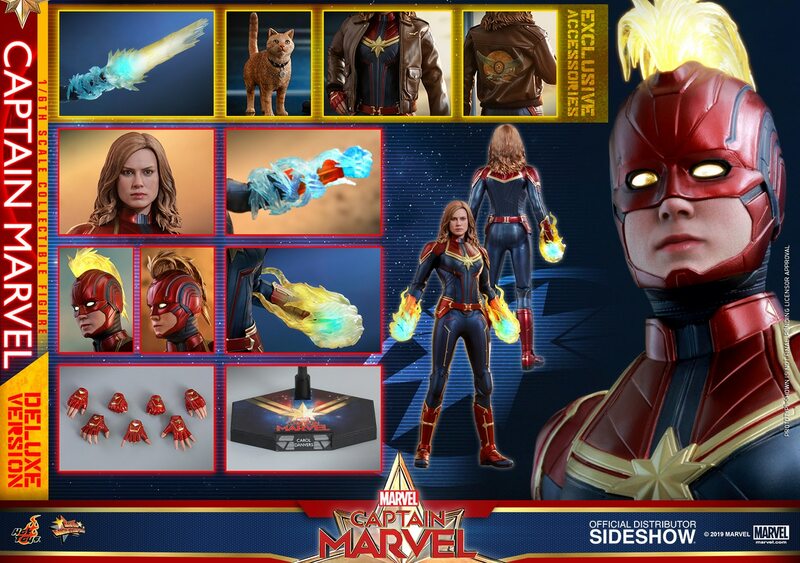 The set comes with a nice array of accessories, showcasing some of Hot Toys' attention to detail! The love the newspaper that the "before" paper to the newspaper that came with Marty showing the "after" paper with the altered history. The case of emergency money is also nicely done, this time with little stickers that you apply to the case cover and for each money slot. Takes a bit of fiddling to get the stickers on, but gives it a nice unique touch to it. The exclusive walkie-talkies are nice, and can be removed, but I'll keep them in their slip case. The set is rounded out with a couple of watches, the hynoptic device, his visor and binoculars, and various hands. Of couse the most controversial part of the figure is the head sculpt. I think the likeness is OK, and the expression is really helped by the usual high quality Hot Toys facial paint app. The realism is nice, although the skin texture is a little too smooth. A few more wrinkles will add some age to the head sculpt for a bit more screen accuracy. 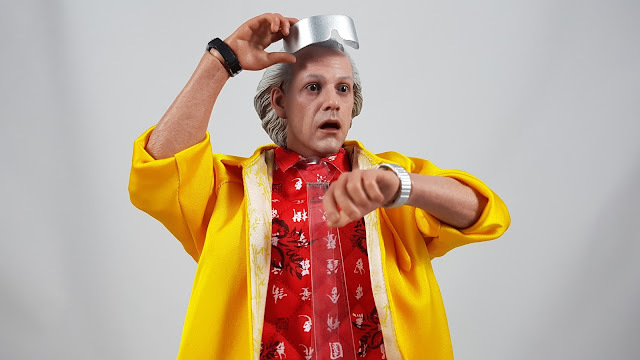 The use of the visor enhances the likeness too, but I went with the pose with him lifting them and looking at his watch. That sort of pose suits the facial expression the most I think. The costuming is the usual high quality again, with various layers and details. The coat is nicely tailored, with a wire along the edge for poseability. I do think the coat and the pants are too yellow though. He comes across a bit too much like a canary, whereas in the movie the coat and pants were more of a dirty orange colour I think. But still, the details in the red shirt, the socks, and especially the boots is very impression. I initially thought the boots had real laces, but they are simply molded laces well painted in red. The articulation is pretty good in the boots too, so that helps with some of the wide stances. 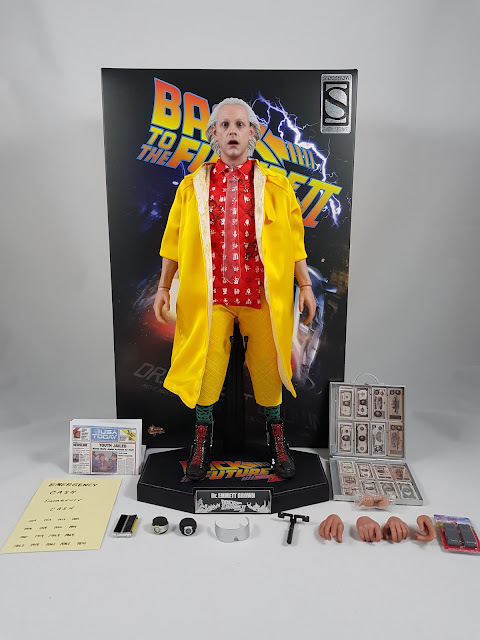 Together with the Marty figures and the Delorean, the Doc Brown figure looks fantastic. I really hope Hot Toys announces a radiation suit Doc from the first movie, as that's pretty much the only other figure I'd love to have in the collection!